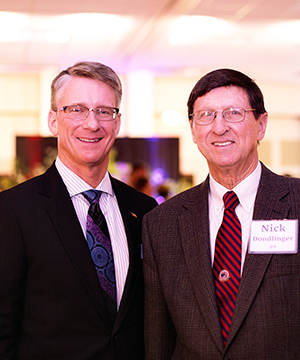 Ten local individuals and businesses were honored for their service to the community at the “Difference Makers for Wichita Awards” Banquet held Saturday, Feb. 25 in the Dugan-Gorges Campus Center on the Newman University campus. 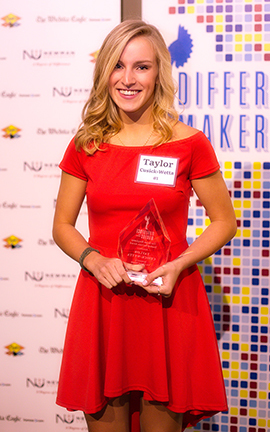 The Difference Makers for Wichita Awards program was launched in October 2016 to celebrate the contributions and positive influences of individuals and organizations that have made a significant difference in the Wichita community. 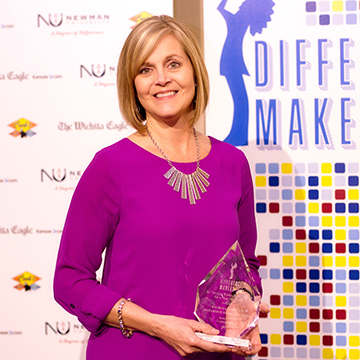 The 2017 Difference Makers event was sponsored by Newman University, Cook’s Heating and Cooling, and The Wichita Eagle / Kansas.com. Individual awards were sponsored by local businesses as noted below. More than 250 people attended the banquet, which was the first of what will be an annual event. The evening included a social hour, dinner and the awards ceremony, emceed by Dave Dahl, judge of Division 2 of the Sedgwick County District Court, former attorney and local radio sports broadcaster. The Murdock Award for Business, named for Wichita Eagle founder Victor Murdock, is for an area business making a positive impact by pioneering efforts to address a major community challenge or by implementing ideas which enhance opportunities for employees and impact our community through creativity and innovation. 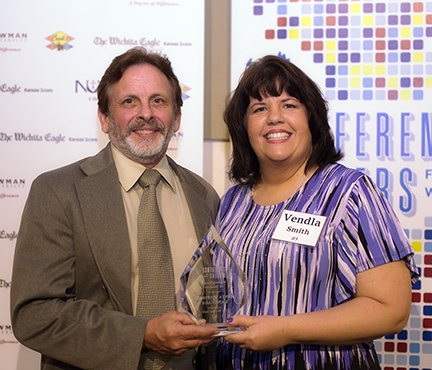 The award was presented by The Wichita Eagle. The 2017 recipient of the award for Business was Zinta Inspired Language. The company seeks to eliminate communication barriers through language training to students from Canada to Ecuador. Russ Meyer, right, congratulates Fred Berry of Berry Companies, Inc. The Russ Meyer Award for Community Leadership, named after longtime aviation advocate, philanthropist and community leader Russ Meyer, is given to an individual making a positive impact in our community through demonstrated excellence in leadership and outstanding initiative to create solutions for critical issues facing the area. The award was presented by Lubrication Engineers, Inc. 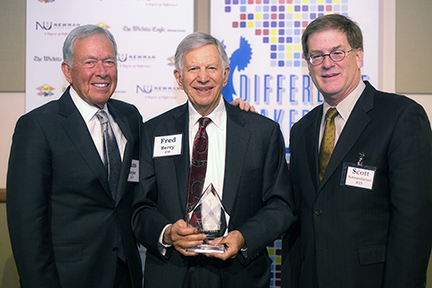 The 2017 recipient was Fred Berry of Berry Companies, Inc., for his community involvement in and service on boards such as Wesley Medical Center, Heartspring, the United Way and the Chamber of Commerce. Russ Meyer, left, Fred Berry and Scott Schwindaman of award sponsor Lubrication Engineers, Inc.
Berry was introduced at the award ceremony by Meyer, who said Berry was a friend of 43 years. The Ivonne Goldstein Award for Community Volunteer, named for the late Ivonne Goldstein who served on the boards of or raised money for more than 50 Wichita organizations, is presented to an individual who through outstanding volunteer community service and commitment is making a measurable difference. The award was presented by Star Lumber. The 2017 recipient was Tom Sanders, former CEO of the DAV/VA Medical Center, who is active with 11 Wichita non-profit organizations. The Tarcisia Roths, ASC, Award for Not-For-Profit, named for former Newman University President Tarcisia Roths, ASC., who played a major role in the growth of the university, is awarded to a mission-driven not-for-profit organization that is creating a significant impact in our community. The award was presented by Legacy Bank. 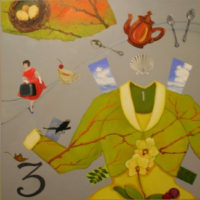 The recipient was the Wichita Women’s Initiative Network (WIN), which provides support and services to women leaving domestic violence shelters. 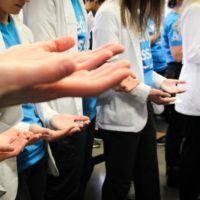 The Brian Bergkamp Student Service Award, named for the late seminarian Brian Bergkamp, who died while trying to rescue a fellow kayaker who had fallen into the Arkansas River, is given to a high school student who by example has demonstrated the selfless and giving attitude to positively transform society. The award was presented by Via Christ Health. The recipient was Taylor Cusick-Wetta of Collegiate High School, who is involved with 14 organizations in Wichita, including the Special Olympics. The awards banquet also featured four “Quiet Heroes,” or individuals who do not seek recognition but rather are inspired through an unwavering commitment to the day-to-day service of others to make a positive difference. The awards were sponsored by Mel Hambleton Ford. The recipients included East High School teacher John Perkins, who has inspired and motivated many students to be successful in school and later in their lives; retired U.S. Postal Service letter carrier Larry Gunkel, who played a crucial role in founding the Letter Carrier Food Drive that delivers food to needy children across Kansas; and Marceline Dover, an advocate for expanding the Kansas Medicaid program, KanCare. 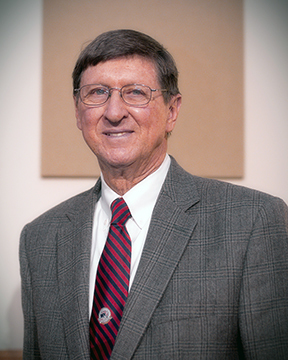 Tom Sanders, noted above, also received a Quiet Hero award. 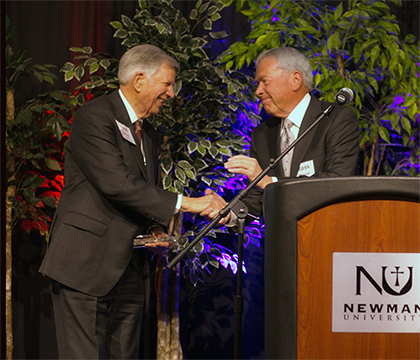 In addition to the Difference Makers Awards, Newman University alumnus Nick Dondlinger was awarded the Cardinal Newman Medal, the university’s highest honor. 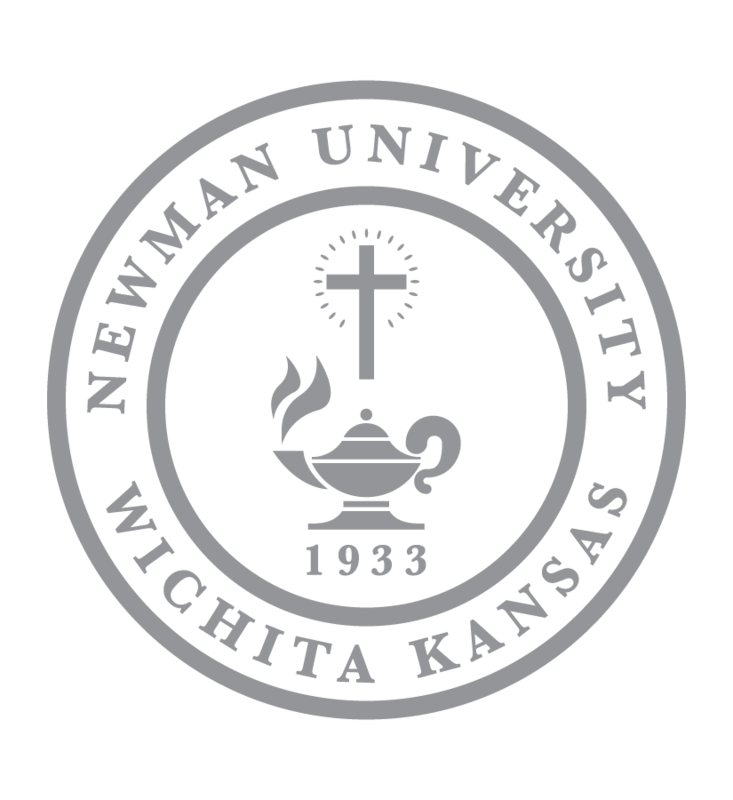 Dondlinger is a longtime supporter of Newman, the local Catholic community and charitable causes in the Greater Wichita area. In an emotional acceptance speech, Dondlinger noted his work in hospital ministry at Wesley Medical Center, and his personal experience with a man whose daughter had just given birth to a child with Down’s Syndrome and wanted to give the baby up for adoption. “That child is an angel,” Dondlinger said to the man. 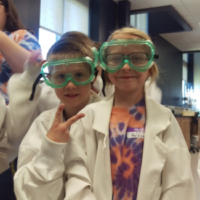 “That child will give much more to you than you ever will to him.” Following their conversation, the family chose to keep and raise the child, Dondlinger said. Dondlinger also spoke of his work in prison ministry through the Diocese of Wichita, his service to his church, his love for his family and his longtime ties to Newman University. The Difference Makers for Wichita program will continue to honor a Quiet Hero each month, and will select annual Difference Makers in all categories for 2018. 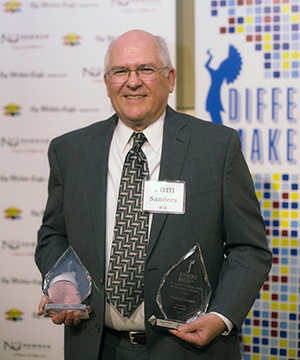 To nominate a Quiet Hero or for more information about the Difference Makers, visit www.WichitaDifferenceMakers.com.